I started James Carter Optical Consulting in 1988 upon leaving a failed start-up in Silicon Valley. This company failed in spite of technical success because of funding and management plans. However, a brief description of its technology gives a very good example of my capabilities and experience. Our product involved two separate laser sources in a highly optimized raster scanning system for high-definition, full-color computer and video displays. My responsibility as system optical engineer required the not only the complete specification and development of the complex optical path, but the specification and supervision of all subsystems controlling or modulating the optical systems as well. 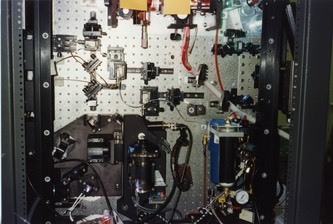 These include the closed loop controllers for the polygonal mirror (with optical feedback) and galvanometric mirror scanners, the analog video preamplifiers for the RF modulators used to drive the acousto-optic modulators as well as the frequency modulation control for the RF carrier used to track the polygon facets. In addition to all of these, the system design encompassed all of the mechanical aspects for mounting precision optics on a structure that is acoustically driven by a high speed, air-bearing spindle motor for the polygon. If this seems to be a very long list of issues, that is because any worthwhile instrument development includes a significant set of technology issues to be considered and solved. If your problem doesn't seem this complex, then, most likely you haven't developed a real product yet, only a prototype. A prototype provides a great, early milestone for small or start-up companies. One or more functional units demonstrate the design and its performance while putting the first stake in the ground when assessing cost versus performance. The commitment of company management and the project team to refining the prototype design to a product design, complete with an integration process plan, gives the real discriminator between technical success and financial success. This final step determines the real cost of manufacturing the unit and the ultimate value proposition that the company provides in the market place. My basic philosophy distributes risk (in the design or fabrication stage) as much as possible to eliminate critical blocks from from the ultimate product process. This involves designing subsystems with well defined interfaces and testable performance characteristics that encourage separate production processes that can benefit from parallel assembly stations and calibration or test fixturing. Thus, it is important to rely on software settings to replace hardware adjustments only within small functional subsystems that have isolated process and code blocks to obviate a complete system calibration in the event of a subsystem replacement or a system firmware upgrade. Software compensation for hardware characteristics should never cross subsystem blocks or controlled interfaces. These approaches culminate from many successful technology developments. I have served on many teams, all with totally different technical objectives. Every one of these has been a success and a credit to all of the teams that I have had the privilege of working with. I think my success garners from my true devotion to excellence and the sheer joy of making new things work well. In many places within this site, I use the plural personal pronoun. This usage is meant to indicate that James Carter Optical Consulting represents a framework of professionals that can contribute to your projects. While I have sole responsibility for this company, I maintain a network of professional consultants and companies that create dynamic teams for projects that require man-power, or expertise, that I cannot deliver on my own. These professional peers include only the highest caliber engineers that I have previously associated with. My criteria for their selection comes from my experience regarding technical expertise, responsibility, and ethical judgement. If your technical requirements are better suited to their experience than mine, I will not hesitate to provide a reference directly to that associate.